The Neato Botvac D6 Connected boasts a brilliant design that's capable of handling any home surface. It handles day-to-day cleaning with little fuss - and that's exactly what you want from your robot vacuum. The Neato Botvac D6 Connected sits somewhere in the mid-range of the company's smart robot vacuum cleaner offering - with the pinnacle being the Botvac D7. The best robot vacuum cleaners 2018: Why do your own cleaning? This is a robot vacuum cleaner packed with plenty of juice, intelligent features and an interesting design that promises to make light work of your floor cleaning, even across multiple levels of your home. The Botvac D6 has a bold, black finish in a classic d-shaped design that's built to handle edge cleaning effortlessly. The design looks similar to other robots in the range and is only really visually different to the Neato Botvac D4 Connected we've tested in a couple of ways: it has a smooth finish and a tiny side brush that isn't present on its cheaper sibling. Otherwise, Neato has stuck to a tried-and-tested formula. The flat-fronted shape is beneficial in two ways: firstly it allows the robot to press close against flat edges of your rooms; secondly it means a large brush can be packed into the robot's compact frame. This brush makes light work of both hard flooring and carpet. It picks up dust and dirt with ease, tackles pet hair and mess, and has a foot-wide cleaning path. Multiple loops of plastic make for a brilliant brush guard capable of preventing the robot from getting clogged up while it goes about its daily cleaning tasks too. The D6 Connected has an accompanying charging dock that functions as its home. This needs to be placed in a clear area with enough space either side for robot to work out where it is and how to get back and charge when it needs to. When docked the D6 stays solid, so if it's inadvertently bumped off the charger at any point then it will comfortably wiggle it's way back onto the prongs to ensure it doesn't lose any juice. It always knows its battery level, so if it's running low on juice mid-clean then it'll come back for a top-up as required. Other simple design features make a big difference too. Like the Botvac D4 Connected, the D6 includes a brilliant cleaning tool with a recessed blade and tough prongs that can be used to cut and remove hair or fibres from the bot's brush to keep it in optimal shape. A clean robot is key to a clean home after all. A low-profile design makes this bot capable of slipping underneath beds, under tables and around the house with ease. It's not nearly as tall as the Dyson Eye. As you'd expect, setup of the Botvac D6 is relatively straightforward. Dock the robot for its first charge, then download the Neato app for either your Android or iOS device. Then all you need to do is follow the instructions the app gives to connect the robot vacuum to your Wi-Fi network. The app itself is user-friendly. Within the settings, you can adjust suction levels, setup a cleaning schedule or just start the bot off on a whole house or spot clean with a simple press of a virtual button. The first clean will start with the creation of a map of your home. The Botvac D6 uses all its sensors and intelligent laser mapping technology to get a working idea of the layout of your house. In future cleans, this map helps it get about and work how to get back to its charging dock. We like the app's simplicity. You can set daily cleaning schedules for each day of the week and for a different time each day if you want. Unfortunately, you cannot set multiple daily cleans, but if you need you can always send it out for another session with a press of the start button in the app or on the bot itself. The Neato Botvac D6 has a methodical cleaning technique. As it cleans it moves up and down the room in a brilliantly regimented manner. This generally ensures it gets to everywhere it needs and gets the rooms clean in a single pass. Another highlight to the Botvac D6 is the strength of its connection (its name is Connected, right?). We saw some problems with the Botvac D4 when we tested where it would randomly disconnect from the home Wi-Fi network, but we did not experience the same problems with this bot. In fact, when one day the broadband disconnected due to problems with the ISP and the bot successfully reconnected on its own when Wi-Fi came back online. Another reason to shell out for the Neato Botvac D6 is the multi-floor mapping capabilities. This robot vacuum cleaner is capable of scanning and mapping up to three different floors of your home using its LaserSmart mapping system, including the addition of No-Go lines to restrict the bot from cleaning certain rooms. The downside of this is you either need an additional charging base for each floor or you'll have to unplug the base and move it and the robot to the other floor(s) in order to map and clean. Those No-Go Lines can be set virtually within the app, so no physical fence barriers are required. However, a roll of magnetic strip is included, which can be cut into custom sized lengths to act as a real block for areas where you don't want to use virtual lines. We found the sensors on this bot more than capable of detecting its environment. This robot cleaner gets close to the edges of rooms and even passes around obstacles with ease. The map of your home isn't set in stone, if things change and a room gets moved around or things get put in the way - a chair for example - then it's no problem for this bot. The flat-fronted design, side brush and mass of sensors mean this robot is capable of getting nice and close to the edges of rooms, borders of doorways and right up to skirting boards too. It often boshes it's way around and partly mounts things as it turns back to go the other way, but we never had problems with it being too rough and knocking things over. The Neato Botvac D6 is an impressive cleaning machine. Regularly daily scheduled cleans pick up the majority of surface dirt, as well as pet hair and general day-to-day mess. We found it managed crumbs from underneath children's breakfast chairs easily and picked up balls of cat fur from the living room carpet as well. The brush needs regular de-knotting from all the hair that this machine picks up, but in our mind that's a testament to the bot's cleaning power. As is the regularity with which the dustbin needs emptying (partly because it's quite small - we think it should be larger). It is worth noting that there are just two vacuuming modes with this bot: house and spot cleaning. Whole house cleaning can be carried out in two different power settings: eco or turbo. The former is quieter and allows the Botvac D6 to clean for longer, the latter mode offers maximum suction and better cleaning performance. There's also an 'extra care' option if you are worried about the bot being a bit boisterous. Spot cleaning isn't quite as user-friendly as we'd like. There's no way to remotely control this robot and send it to a specific location. In other robot vacuums we've been able to select a point on the interactive map, but here you have to physically pick the bot up, carry it to the dirty spot, then set it off in spot cleaning mode manually. Not ideal. With the Neato Botvac D4, we found the high-performance filters a little tricky to keep clean. The ridged design means that the dust and dirt regularly gets stuck between the filters fins. That's not the case with the Neato Botvac D6 though, as this robot vacuum uses so-called Ultra Performance filters which don't get as clogged up as often, which makes cleaning them easier. A fine mesh-like netting prevents larger bits of dust getting stuck to the filter itself, so it remains more capable of cleaning more often, with less interference. From what we've seen, the Neato Botvac D6 offers slightly more powerful and efficient cleaning than its D4 brother. But one downside is the amount of noise made as it cleans. Its brush seems noisier than the Botvac D4 and it blows an equal amount of air too. Of course, the robot cleaner is less noisy than a standard full-sized vacuum cleaner, but it's not the quietest we've had in the house. The Neato Botvac D6 Connected is not only "connected" to your Wi-Fi, it's also capable of working in other smart ways too. Not only will it work with the Apple Watch, it's also compatible with the usual voice assistants too. For Amazon Echo owners there's an Amazon Alexa skill, while Google Home owners can make use of the Google Assistant ability. This gives you the ability to use your voice to send the robot out on a clean. You can also do simple things like start, stop, pause and resume cleaning. Other commands include the ability to find out battery level or return to the charging base too. 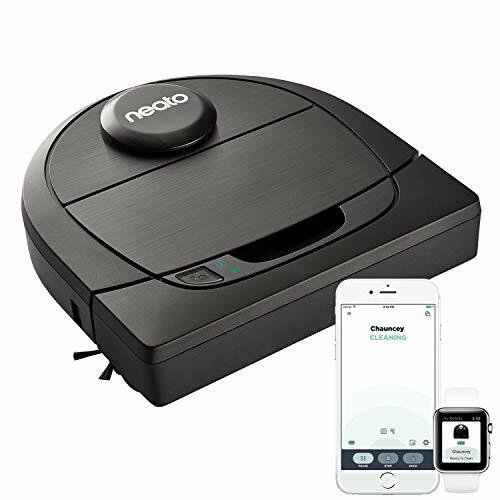 The Neato Botvac D6 is also compatible with IFTTT, giving you the freedom to create 'recipes' to do other clever things with it too - like pausing cleaning when your phone is ringing. There's even a Facebook Messenger Chatbot to control the bot. It's certainly as connected as its name says, which is fantastic. There's no denying the Neato Botvac D6 Connected is one of the best robot vacuums we've tested. It's packed full of features and offers excellent cleaning results on a regular basis. Being able to clean multiple floors is a bonus and the way the combo brush system handles any surface makes this bot a brilliant addition to any home. A simple user-interface and easy-to-use design make the Botvac D6 a real joy to have around. For the money, it's well worth considering - so long as you aren't put off by the noise. The Botvac D4 is the slightly cheaper alternative in the Neato range. It has similar cleaning capabilities, only without multi-floor mapping powers. We found it a bit quieter when cleaning, but also had some occasional connection issues that niggle. It's certainly affordable though, so worth considering. The Ecovacs Deebot R95 MKII is another robot vacuum worth considering as an alternative to the Botvac D6. It too has an intelligent mapping system and that allows you to remotely control the bot and send it to a specific place on the map with ease. The Dyson 360 Eye is one of the best robotic vacuum cleaners we've tested. It's a tad taller than the Botvac D6 but is bursting with powerful cleaning features. It does come with quite a hefty pricetag, but you do get what you pay for. The Roborock S5 is another intelligent cleaner with brilliant real-time mapping capabilities. This too might be a worthy alternative for your robot vacuum shortlist. Simple features like washable filters, an easy-to-use mopping system and more make this bot highly appealing. It's cheaper too!